"Making homemade yogurt in your Instant Pot® is so easy! 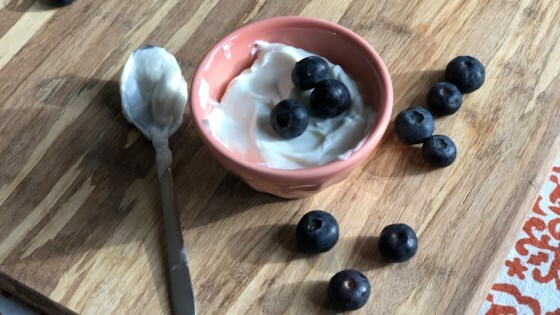 Try this thick, rich, and creamy Greek yogurt made with only 3 basic ingredients." Turn on a multi-functional pressure cooker (such as Instant Pot(R)). Select Yogurt function and press Adjust button until Boil appears on display. Pour milk into the pot. Close and lock the lid; set timer for 45 minutes. Check with a thermometer until temperature reaches 185 degrees F (85 degrees C). Remove pot and place on a cooling rack until temperature reaches 110 degrees F (45 degrees C). Take 1 cup milk and mix with plain yogurt and vanilla extract in a bowl; whisk until well combined. Pour back into the pot and reselect Yogurt function. Close and lock lid. Set timer for 9 hours. Strain yogurt with a fine strainer or nut bag and store in sterilized glass jars.